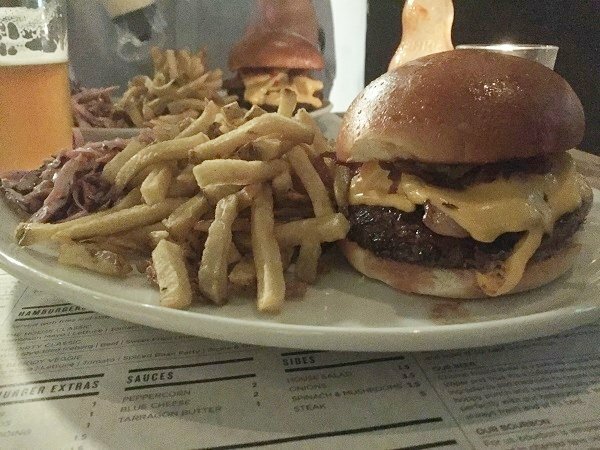 From a 2012 pop-up restaurant to a 2013 street food van to a 2014 bricks and mortar restaurant on St Nicholas Street, Chomp‘s assumed a variety of guises over the last few years, all with one thing in common: some seriously good burgers. At the quieter end of St Nicholas Street, it’s all too easy to miss the restaurant with its unassuming black frontage – but step through the door and you’ll be seriously glad that you didn’t miss out. The black paintwork from the outside is mimicked in the interior’s dark, moody lighting and industrial vibe, with plastic seats and plain wooden tables that can sometimes wobble a little on the uneven floorboards. Head through to the back of the restaurant and you’ll see the tiny amount of kitchen space that the team have available to work with – it’s just as well it’s a simple menu. Burgers and steaks are what Chomp do, and they do them very well indeed. Dry aged and sourced locally from British breed cattle, it’s good quality stuff: available in main courses ranging from £10 to £50 depending on whether you opt for a burger or a chateaubriand for two. The menu itself is simple: the aforementioned burgers and steaks, along with three starters, two desserts and a smattering of sides. 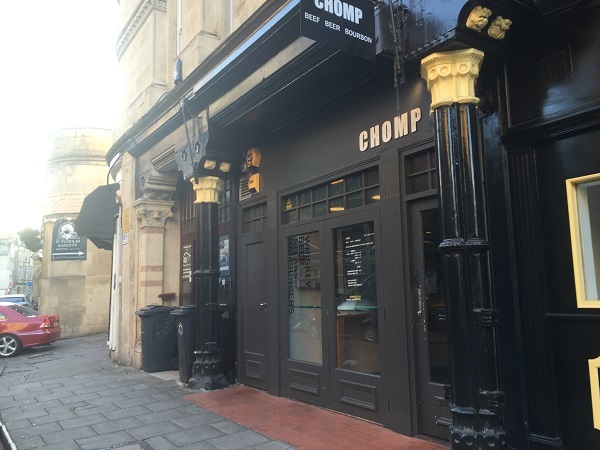 On the drinks front, it’s well worth choosing the Chomp house brew if you’re a beer drinker (£4) – specially brewed for the restaurant by local brewery Wiper & True with a blend of 7 different hops. Alternatively, choose from the short but sweet wine list, selected cocktails, a bourbon and rye menu or a few choice soft drinks. With such a short menu, it wasn’t hard to make our choices, and we started by sharing a portion of the black pudding beignets (£4 for 3, £6 for 6, £8 for 9). OK, so they won’t win any healthy eating awards, but if you’re going to choose a “fast food” restaurant, it’s best to do it in style. 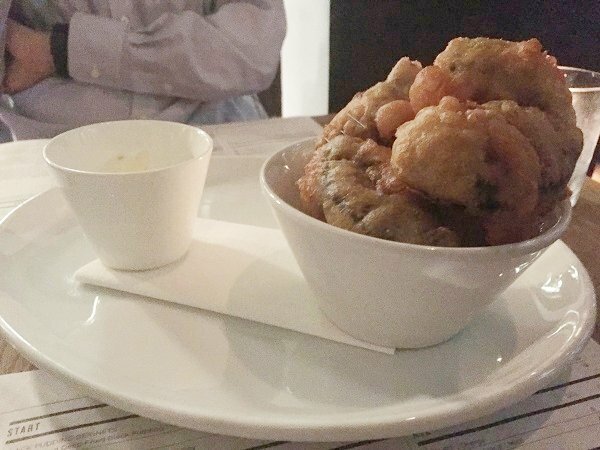 These larger-than-bite-sized chunks of rich black pudding were encased in a generous amount of light beer batter and deep fried, and paired perfectly with the accompanying garlic and chive mayo that not only added more flavour but somehow made the beignets feel less heavy. For the main, it had to be the Dirty Classic (£13) for both of us – a generous serving of crunchy house-made slaw and the things of beauty that are skin-on chips – the skins add so much more to the flavour. The burger itself? Outstanding. Perfectly juicy and seasoned well, it’s always good to see somewhere that serves them slightly pink in the middle. Brioche is always a winner in my book when it comes to burger buns, as it tends to hold together nicely, and the ratio of oozy, melty cheese and bacon to burger was spot on. The sweet fried onions and pickles added both flavour and crunch – basically, a winner all round.